Taste test: These chips are medium-wide rippled, thick cut and very crunchy. They're also got a lot of nice flavoring on them. I don't know whether they really taste like buffalo, but they do taste very good. Smell test: Nice smell, sort of like Worcestershire sauce. 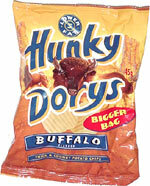 This snack was discovered by Mark in Ireland. Review published .